Prince George (Colin Firth) has been afflicted by a debilitating stammer since childhood. 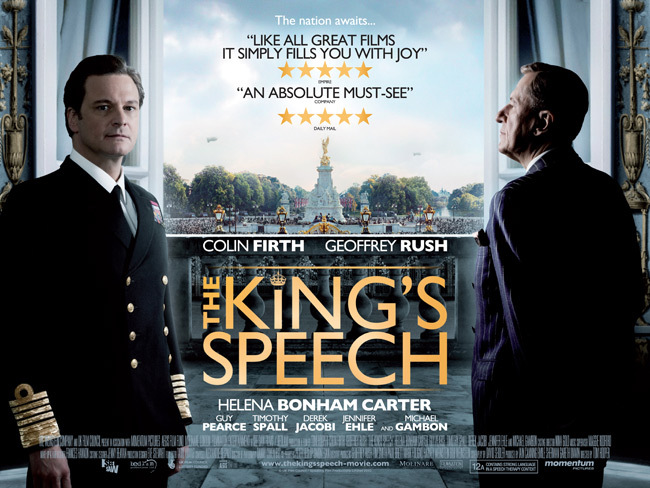 When his brother abdicates the throne, and war is looming, he hesitantly turns to Aussie Lionel Logue (Geoffrey Rush), who is a speech therapist with unconventional methods, in order to be able to soothe a frightened nation. Despite its decent cast and nice costumes, this film was initially low on the radar for greatness. However, after a sneak-peak at a film festival in America, bloggers and Tweeters announced it to be an Oscar favourite and the world opened its eyes to it. But this is not a pretentious film – this is a crowd pleaser. The script transforms history into an approachable form, and it’s dramatic, witty and enlightening. It focuses on the unlikely friendship between the outspoken Aussie and the reluctant-speaking aristocrat. This is a story less about fixing a voice than fixing a mind that has been bullied by his father since boyhood and has not had a childhood in the face of the responsibilities for the throne. Even as Firth doesn’t have many words to say, he doesn’t stop communicating sadness, yearning, and pain; intelligence and humour demanding an escape; and the self-possession of a man born to privilege. Rush as Logue, is in equally fine form, a brash man with a huge heart. Helena Bonham Carter is a lively Queen Elizabeth, portraying both a teasing wit and a devoted wife. The script, the actors and the loving shots of London make this a film worth watching.